The balcony of the nostalgic Strand Theatre that gave bird’s eye view of the large screen in what is now the main theatre has become a construction zone. The old seats have been removed to make room for the modern seats that will have cup holders and flip-up armrests. The new seats are larger which will decrease the amount of seating from 225 to 165. Theatre officials see that as an equitable tradeoff. Joe Diamond, left, board member, and Tracey Peyton, managing director, stand at the ticket booth at the entrance of the Strand Theatre. The 101-year-old theatre’s balcony is being remodeled to to reflect the more modern movie space. 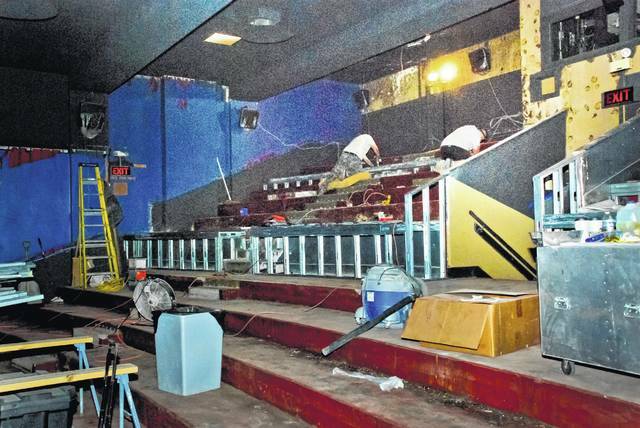 For the first time since it was closed and outfitted with a movie screen in 1986, the balcony theatre at the Strand Theatre in downtown Delaware is undergoing a major facelift. “I think everyone in the community has been looking forward to this renovation for at least a year,” said Strand Theatre Managing Director Tracey Peyton. Expected to cost the Strand Theatre and Cultural Arts Association — the nonprofit who owns the 101-year-old theatre — anywhere between $200,000 and $225,000, the balcony theatre renovation project includes seating and cosmetic upgrades. To give the balcony a fresh look, construction crews have been working since Sept. 1 to install new flooring, acoustical wall carpet and 21st century movie theatre seating. Due to the sheer size of the new seats, which will include cup holders and flip-up armrests, once the renovations are complete, the number of seats in the balcony will decrease from 225 to 165, which theatre officials feel will be a worthwhile trade off. “We are going to lose two rows of seats up there so that we can put in the bigger seats that will provide more leg room, but we never really used all 225 seats up there to begin with,” Diamond said. Expected to reopen to moviegoers by Nov. 6, Peyton said she’s eager to see the community’s response to the upgrades. In the past, Peyton added, when moviegoers discovered they were destined for a trip to the balcony, it was often met with groans of despair. Those days, she hopes, are a thing of the past. “Many people did not want to go up there,” Peyton said. “People will love it once the project is finished as the balcony theatre will be right on par with our other theatres. “I think that it will be a welcome addition to the community, and it’s our way of giving back to the community that has supported us,” she added. Not only will the upgrades provide a better movie-going experience, Diamond said, but it will also allow the nonprofit to better market the balcony space to businesses or members of the community interested in renting it out for meetings or parties. In order to keep one of the 10 oldest, continually operating first-run movie houses in the United States open, the Strand Theatre and Cultural Arts Association relies primarily on admission fees (minus the studios’ 50 to 65 percent cut of box office sales) and concession fees. With the Strand’s ticket and concession prices lower than most, Diamond said, it doesn’t leave much profit to put back into theatre improvements. The historic theatre, however, has had luck obtaining grant funds over the years, most recently a $175,000 grant from the state that allowed the nonprofit to move forward with the balcony project. Unfortunately, Diamond said, the nonprofit needs to raise somewhere in the ballpark of $50,000 to complete the project. In the meantime, the balcony theatre will open in November with approximately 100 of the 165 seats installed. To raise the additional funds, the nonprofit is currently running a campaign in which the community can donate to help purchase the remaining seats, which cost $275 each. Additionally, moviegoers who visit the concession stand can ask to have their order rounded up if they wish to participate in the fundraising campaign. Both Diamond and Peyton thanked the community for its support over the years. “It’s a real testament to the community that we are still here because we don’t have that big corporation behind us,” Peyton said. Once the balcony project is completed and paid for, the next project for the Strand involves renovations to the lobby and concession area, Diamond said. Peyton noted that the nonprofit is also seeking financial support from businesses or organizations interested in acquiring the naming rights to the main theatre and balcony theatre. The Strand’s other theatre — the First Commonwealth Bank Side Theatre — is already spoken for. Anyone interested in donating to the Strand or renting one of the theatres can contact Peyton at 740-816-1938.
https://www.delgazette.com/wp-content/uploads/sites/40/2017/09/web1_DSC_8080_1F.jpgThe balcony of the nostalgic Strand Theatre that gave bird’s eye view of the large screen in what is now the main theatre has become a construction zone. The old seats have been removed to make room for the modern seats that will have cup holders and flip-up armrests. The new seats are larger which will decrease the amount of seating from 225 to 165. Theatre officials see that as an equitable tradeoff. 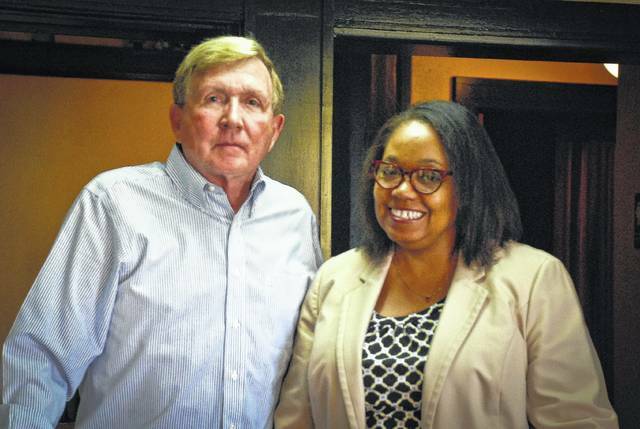 https://www.delgazette.com/wp-content/uploads/sites/40/2017/09/web1_DSC_8121_1F.jpgJoe Diamond, left, board member, and Tracey Peyton, managing director, stand at the ticket booth at the entrance of the Strand Theatre. The 101-year-old theatre’s balcony is being remodeled to to reflect the more modern movie space.